When you are looking for that extra little push during a long day on the water the Advance Elements Rapid Up Sail provides. 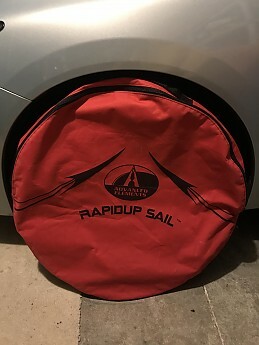 Having attached this to both a single and tandem kayak, the Rapid Up Sail can produce enjoyable speed with favorable winds. 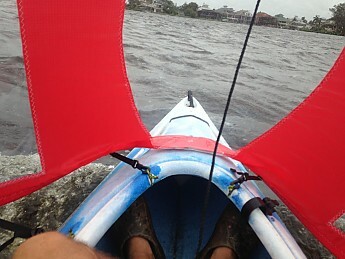 Living on the coast in SW FL, I am surrounded by water, so I spend a great deal of time paddling...both kayak and canoe. Over the years I have seen some pretty elaborate and expensive canoe/sail setups, even on kayaks...but that's not what I was looking for. With interest, I kept my eye on various sites that advertised the AE Rapid Up Sail, and when the price dropped, I jumped. 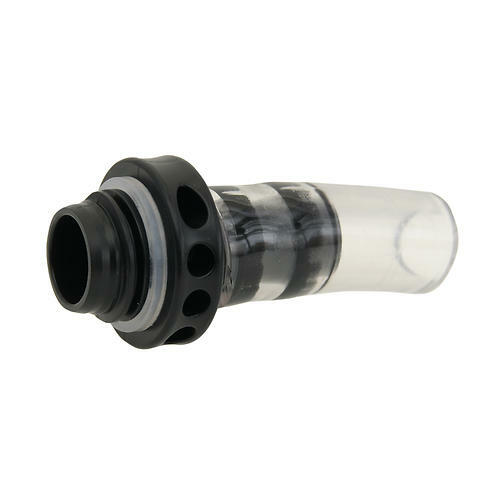 Being fully transparent, I think this particular product should be priced out at half its MSRP price of $99...just saying. 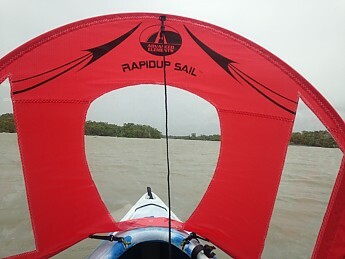 Upon receipt of the AE Rapid Up Sail...I read the directions, combed setup reviews and Youtube video instructions. Well worth the time to avoid unnecessary frustration. Nervously, I did have to drill several small pilot holes in my Wilderness Systems Pamlico decking to install small para-cord loops for quick attachment due to lack of attachment points. 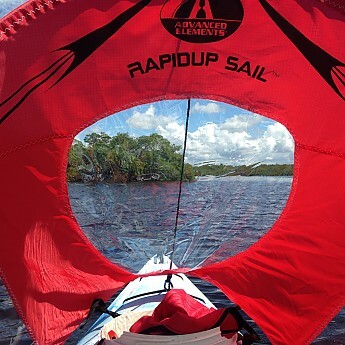 I attached and unattached the Rapid Up Sail several times in my yard to save time and avoid issues on the water. I should have reread instructions, as I improperly ran the top line straight back (as you'll see in some pictures), rather than to the bow and beneath the sail to assist in dropping the sail when necessary. However, it worked just fine. I was then able to quickly attach and detach the snap clips to the para-cord loops when either stowing the Rapid Up sail or moving it between boats. As you can see from the above photo, catching a good wind can move you along at a good clip...I forgot to use my GPS...but estimated this run between 4 and 5 knots, creating a smile-producing wake. 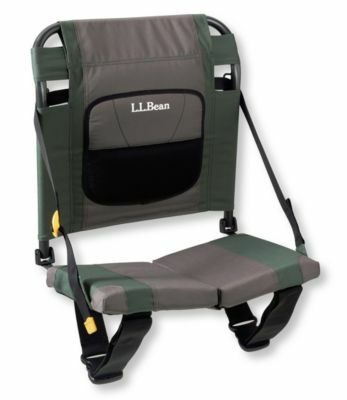 The Rapid Up sail material is stout and the three large viewing windows are securely stitched in and made of pliable but thick plastic (like that on a high-end tent fly). 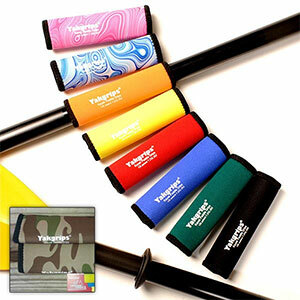 Advanced Elements cites the fabric as a "durable, high quality rip-stop sail cloth." I concur. The viewing windows offer unimpeded views, so have no fear of colliding with unseen obstructions. Advanced Elements claims the Rapid Up sail "folds compactly," and I suppose that's relative...as sails go. Spring steel is sewn in the outside circumference of the sail, which gives the Rapid Up a stable profile...and folds simply (much like a windshield sunshade). 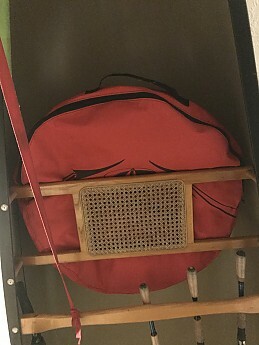 But as seen from the above photo, folded and in its storage case the Rapid Up Sail is the same outside diameter as a Honda Civic tire. It's a bit of a stow, wedging it below the front deck on a smaller kayak and even on my tandem kayak...but easily stowed on my canoe (as seen stowed below the front seat of an Old Town Penobscot 18). 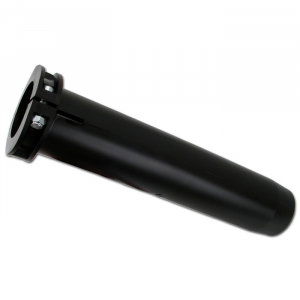 Realize, that you can fold and secure it on the bow without needed to detach and stow it. Give yourself some lead time for initial rigging to your paddlecraft. Be willing to be creative in attaching rigging lines. If you are of larger stature...in a smaller craft, you will block most of the wind needed to billow the sail. Keep your eye on the clips, or replace them with small carabiners. If you are not familiar with "tacking" or sailing in general, research it a tad so you aren't sitting in the middle of a body of water motionless, expecting to be whisked away by the Rapid Up Sail. Under wind, you will be using your paddle to rudder...a canoe paddle or half your kayak paddle works great...but a full double blade is ungainly and cumbersome. Other times, you'll be paddling to find the perfect wind to catch the sail. On smaller boats like my 10.5 Pamlico, I'd experience some nose-dive with strong Tropical Storm gusts...I simply leaned back more to level out the hull (yes, I realize it's probably not the wisest to be out on the water during tempestuous seas...but the wind and waves are epic). Parting thoughts: After a year of use, I am happy with the purchase. It has its limitations, but I'm okay with them and made my own adaptations. I don't own a kayak, but this thing is cool enough to make me want to buy one! Nice review!